High Peaks Pure Earth has translated a blogpost by Woeser written on January 15, 2012 for the Tibetan service of Radio Free Asia and posted on her blog on March 2o, 2012. The starting point for Woeser’s article is the self-immolation of Lama Sobha that took place in Golog, Amdo on January 8, 2012. For a report on this event and to read Lama Sobha’s last message before self-immolating, follow this link to International Campaign for Tibet. March 17, Rebkong, Amdo, 43 year old farmer Sonam Thargye sacrificed himself by self-immolating. 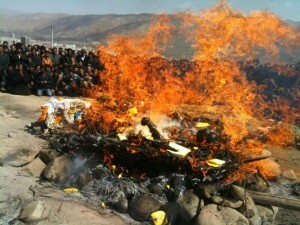 The photo shows thousands of Tibetan monks and lay people at the cremation. On January 8, news spread from Golog, Amdo, that a Rinpoche had self-immolated. It quickly became known that it was the 42-year-old Lama Sobha who had enjoyed immense popularity and was inspirational amongst local people. This was really incredible news! According to Tibetan traditions and customs, a Rinpoche is a supreme monk and now a Rinpoche who was highly esteemed gave his life through self-immolation, this indeed made people feel extremely shocked. I immediately wrote a post on my blog, stating what I knew about this case. Over the past few years, it has always been like this, ever worsening news have been reaching us very frequently, most of them related to the situation in Tibet. I have been trying very hard to record them, to provide accounts of them, to engage in arguments and debates, even to the point that I did not have enough time to shed a single tear. I told Wang Lixiong that even Rinpoches are now self-immolating; he was very sad, he paused for a long time and said: “these self-immolations cannot go on like this.” He said that something had to be done, one could not just sit there and listen to the bad news coming in, one after the other. At this moment, a voice of reason is very important. It does not matter whether this is a Tibetan voice, a Han Chinese voice or anyone else’s voice, but the voice of reason must be widely spread, sincere discussions about what can be done are imminent. Wang Lixiong spent two days writing an article of less than 2000 words; at the time, there had already been 16 cases of self-immolations within Tibet. Originally, I planned to post segments of this article on Twitter to initiate related discussions, but on January 14, the news came out that another Tibetan from Ngaba had self-immolated. It was obvious that our efforts to write articles and lead discussions were lagging behind the speed of flames that the Tibetans who burnt themselves burst into. 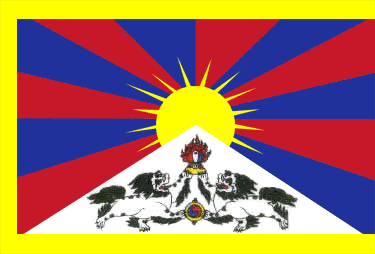 I absolutely respect those Tibetans who have self-immolated. Even though not every goal that those who decide to self-immolate have in mind is necessarily realistic or will come true, but regardless of whether they have any clear awareness, their overall impact lies in that fact that they hearten and inspire the courage of an entire ethnic group. Courage is a precious resource, especially for those who are disadvantaged in terms of material resources, courage always represents an important way for the weak to fight against the strong. Those people who self-immolate do indeed need great courage. 16 Tibetans have had this unshakable and boundless courage, which has reached its peak with the latest case of Lama Sobha from Golog, Amdo. In terms of heartening and inspiring an ethnic group’s courage, I believe that at this point, this has already been accomplished. Now, the question is a different one; what are we going to use this precious courage for? Continue self-immolating, burning the courage down? I think that going on like this would be wasteful; the martyrs’ courage should instead be used to produce substantial results, this is the hope of the pioneers who already self-immolated and only in this way will their sacrifice be fully valued. A Tibetologist commented on this: Wang Lixiong shows his genuine respect to those who self-immolated, he does not “evaluate the situation looking down from some higher ground” neither does he insult the Tibetans who engaged in self-immolation. I admire Wang Lixiong for expressing his honest attitude from within China, clearly addressing: these Tibetans who self-immolated are martyrs of the Tibetan people and have heartened and inspired the courage of an entire ethnic group.